Our new Travel Opportunity Lead has been specifically created for home businesses in the travel industry! And, at a competitive price! Your lead will not be shared with another marketer! You will be the only person to call them back! When a prospect responds to our online ad, you receive the lead details instantly via email! Call the prospect back right away for the best results. Any leads that have a bad telephone number or claimed they did not respond to our travel opportunity advertisement will be replaced with a new lead. Leads must be submitted within 5 days of receipt within your customer account. These leads will be uploaded into your personal marketing system instantly when you receive each lead. 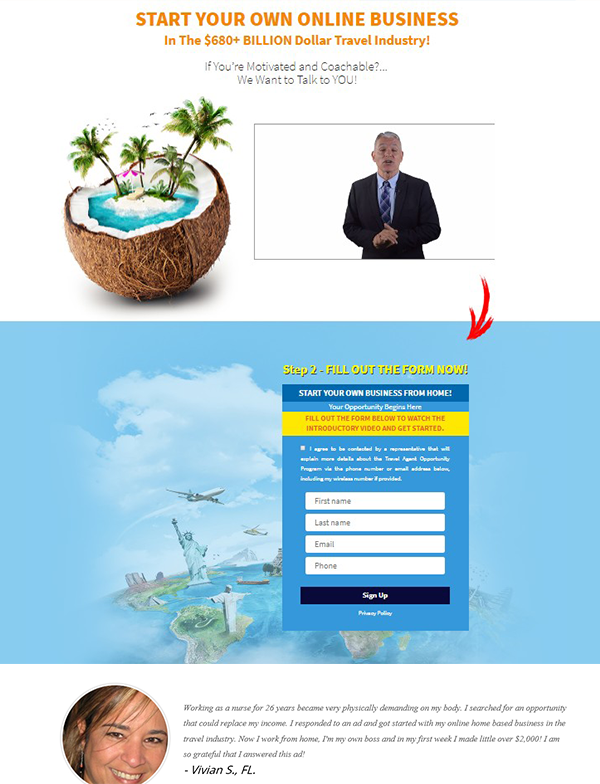 Other types of "home based business leads" responded to a advertisement that looks similar to many websites. This makes it difficult to remind your prospect why you are calling. With Travel Opportunity Leads you know your prospects are specifically interested in travel and you know the ad they responded to. For best results with these leads, you can remind your prospects "you responded to my advertisement about working in the travel industry".